Stuart Drexler is the founder and CEO of Jago Studios. They are the gaming studio behind the upcoming mobile game, GPK the Game. Garbage Pail Kids collectors have been eagerly awaiting the game since it was first announced last year. In addition to running the company, Stuart is also the Executive Producer of the game. He attended this year’s Gross Card Con in Las Vegas. Stuart spoke briefly prior to the artist’s panel, and was busy the rest of the time talking to collectors and handing out some GPK the Game stickers. I was able to sit down with Stuart for an interview at the show. In the interview we discuss why Jago choose the GPK brand for its first game, how they are using and incorporating the original artwork in the game, some of what collectors can expect when the game launches, and finally a little bit about release dates. GPKNews – Thanks for talking with us Stuart! You’re the founder of Jago Studios and GPK the Game is the studio’s first game. Why did you guys decide on GPK? Stuart Drexler – So I grew up as a Wacky Packages kid. Mad Magazine, that really inspired me, and twisted my head a little bit as a kid. That was my entry into the world of satire. I was a little older when GPK came around, so I wasn’t one of the targets in that age range. I always knew how big it was, and it was phenomenal to see what it became. GPKNews – How aware of GPK were you? Did you collect GPK when you were a kid? SD – Again, I’m not going to say my age, but I was just older than the target audience would have been. I was a teenager when they came out, so it wasn’t for me. I looked at them and said, wow. I went into the kids industry. So when I started my career after college most of what I did, for however many years, was around kids brands; Barbie, Elmo, Sesame Street characters, Polly Pocket, Action Man, Harry Potter, Club Penguin, Moshi Monsters, and so forth. I’ve had a great privilege to work with these great brands. Come to the point when I wanted to form my own company the inspiration really was if you were going to bring a new brand out today. Let me turn it around, there hasn’t been anything like this, since. We had Mad Magazine, Wacky Packages, and GPK. You look at the other card brands that have come out since, Pokemon, Yugioh, Magic the Gathering. Those are all in the card game genre, but they are all fantasy sci-fi, there’s no humor. Really for us it was this opportunity to bring together card, gaming, and humor. Jago Studios is committed to creating social mobile games with beloved humor brands. That’s what we are all about. GPKNews – In a previous life you’ve been in charge of some major toy brands like Polly Pocket and some large online MMOs, like Moshi Monsters and Club Penguin. Those were new brands. With GPK you are taking on a brand from the past. Is that different in any way? GPKNews – How has being partners with Topps on the project been? SD – They’ve been fantastic. I’ll be honest going in it was a little bit of a concern, corporate if you will, larger company. How are they going to be, or how tight are they going to be. Like it was said at the artist panel, they’ve really been fantastic partners. They are thrilled at having us involved in this. They’ve been great. GPKNews – Topps has a number of mobile apps/games where collecting digital cards is the main focus. With this game it’s a card collecting/battling RPG, which I think surprised a lot of collectors when it was announced. 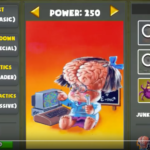 Why did you choose these game mechanics for a GPK mobile game? SD – The cards are already being collected, the physical market, there’s a huge audience. Its got 30 years of backstory. We didn’t want to replicate that. We wanted to add something new to the universe. There are, how many thousands of, ardent collectors over the years who are still involved and passionate about this. But there are millions of people who grew up with GPK as kids, may even still have their cards. In fact, I’ve talked to quite a few of them, “My 6th grade girlfriend took some of my cards.” Other ones, “My mom has them.” I’ve had two of my closer friends give me their cards. They said I want you to have these, I hope they inspire you. The point of all that is, there are millions of fans of the brand that may not even realize they can have a chance to get involved with GPK again. We really want the game to be accessible, wether or not you’re a collector. 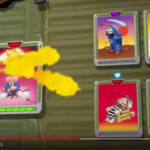 So there’s a lighter collection aspect within the game, we’re not going have thousands of cards in the game. Start with tens and ultimately grow into hundreds. Its of the more traditional model of a roll playing game where you get a few characters to being with, you level them up, you unlock new characters, you choose which characters you want to go after, and chase cards that will be great at building your strongest teams. There’s a lot of strategy involved in figuring out which characters go well together and make the best teams against other teams of characters. 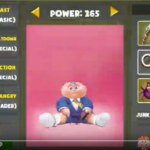 GPKNews – During development how hard has it been to incorporate GPK characters into the game? SD – This has been one of the most gratifying elements frankly. We explored early on reimagining the characters into 3D. Its been done with a number of other brands, I won’t name names. Sometimes more successfully than others. It just came across to us that was going to be a challenge to do, and do really, really well. The inbuilt love and instant recognizability of the actual 2d artwork, that those artists have done, is really the biggest equity in the brand. So we stopped running away from that, and really leaned in and embraced it. We used animation tools that has allowed us to take the actual card artwork and bring it to life. The characters in the game animate from the characters everyone instantly recognizes. 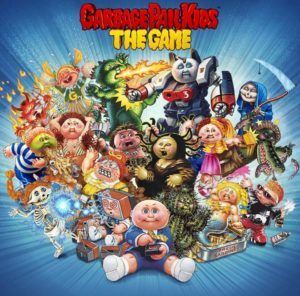 GPKNews – Who do you see as the target audience for GPK the Game? Kids? Adults? GPK collectors? Everyone? SD – Well I can say everyone, and untimely we hope it’s everyone. Our initial target audience is those people that know the brand from their childhood. So its 35 years old and up. We are seeing in our early marketing its 25+, and the majority of the people signing up on our Facebook lists are 30 and older. Not surprising whatsoever, that’s also where the roll playing game audience is. That said, there is a lot of hand me down that happens. Those folks now have kids of their own, so there’s going to be a lot of hand me down that way. We hope that other people will discover the brand for the first time, and say what the heck is this crazy thing and fall in love with it. GPKNews – You guys are animating these characters. It will be the first time collectors see their favorites animated, even if the animations are short. Again how are you striving to stay true to the original artwork, while making entertaining animations? SD – We’ve done our best to stay true to the character and bring out the essence of what each character would have and would draw upon. We are actually right now working on bringing some voiceover and enhancing the sound effects in the game to bring that to the next level. We haven’t had a lot of feedback specifically about what we’ve done so far. But the general feedback we gotten from individuals we’ve spoken to, from people that have played the game, is they love seeing the characters brought to life. That’s one of the most magical and charming moments in the game and they want to see more of that. GPKNews – I know a lot of the details haven’t been released about the game yet, but let’s give these questions a shot anyway. Once the game is released will there be ongoing support, game updates, new characters, etc? SD – We will launch with an initial set of characters that we’ve already built. We know what our next 6 or so characters that we will build and add to the game. Once we are live and launched globally then we will be adding new characters on a regular basis. The cadence of that has yet to be determined. Monthly there will be new content in the game. I don’t want to say too much yet about the other elements that will be part of our live operation plan. What I will say at a high level is, the beauty of this brand is that it is satire, it’s a spoof. That’s one of the things that drew me to the brand, even though I didn’t grow up as a GPK kid. It fits right into that Wacky Packs, Mad Magazine sarcasm. I grew up with Monty Python, Benny Hill, wit, sarcasm, irony and the fact that you watch over time what Topps has done on a regular basis. Lampooning whether its pop stars, or sports figures, or political figures. The opportunity to keep this topical and to bring the brand to almost a weekly relevance. We have the opportunity to, not just with the cards, but other content that can surface in the game experience that gives you a laugh. That makes you hold the phone up to someone and say holy you know what, you’ve got to check this out, look what they’ve done. In the same way that when you open those card packs that you say, oh my God that’s crazy. That only happens with printed sets so many times a year. We see this as an opportunity to be doing it on a much more regular basis with fans of the brand. And again expand the market, the appeal, the potential for GPK that isn’t just physical cards. GPKNews – How will Jago pick and choose what characters appear in the future? Are all GPKs fair game from OS, ANS, all the way to today’s sets? Do you have any plans for original characters to appear in the game first? SD – We’ve gone back to series 1 and 2 because, as I’ve said earlier, we’re appealing not just to the core card collectors but to a much larger fan base. They’re the most recognizable. That said, we’ve peppered in cards that are much more recent, some with pop references, and others we just love the look of and they’re going to be really fun and would be a great card to battle within the game. There are some functional considerations we have. There are thousands of characters, and we’ve gone through quite a few of them to come up with the list we have. There are times when something won’t visually work as well in a game situation, so we’ve steered clear of those. Others where the scale difference, some cards are torso up, some are just the face, others are full head to toe, others are where there’s a whole scene of multiple characters in a card so that becomes a little more problematic. A lot of factors that come in to play. Simple answer is, Topps has given us carte blanche to all of the content they’ve created. They’ve also said, as and where appropriate, we can create new characters for the game. 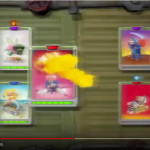 That could launch just in the game, and if they like it well enough and it fits into some of their plans then it could become a physical card. There are things afoot there that I can’t really talk about. GPKNews – Will GPK the Game be a Freemimum game at launch? SD – Yeah, it’s a standard free play game, free to download no charge for that. You can play the game forever for free. There’s no requirement to purchase anything in the game. 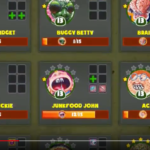 There’s no hard wall, I know some games have had a lot of flack for having a hard wall where you can’t progress if you don’t spend real money in the game. We’re not going to have that. There are opportunities to buy cards within the game as well as coins, and our funny money, toxic gems which speed your progress through the experience. GPKNews – When first announced, the release time frame you guys were shooting for was Q4 2018, and the latest info you announced was Q2 2019. Why the reason for the delay? How confident are you that you will hit that Q2 time frame? SD – When you’re creating a mobile game or any game, a game is a lot more complicated than just creating a piece of artwork for a card. I appreciate to the fans to give us the time to really get it right. We want to make the best possible game. We love this brand. We’re making this for the fans, and for everyone who grew up with the brand. We’ve done both quantitative and qualitative testing. We’ve got some fans in playing it. We are iterating all the time, taking feedback in, making some tweaks, making some changes, making improvements. In terms of timing, my marketing lead has sworn me that you never specify the release date until you are right there and 100% ready to release the game. I’m not going to specify a specific date. It will be later this year, we are shooting for summer. We are doing our best to hit those dates. At the end of the day if there’s something we feel we can tweak and improve, that’s really going to make a difference, that when we launch live people are thrilled and excited and understand why we spent that time and put all that love an energy in, then that’s what we are going to do. GPKNews – Do you have any additional plans for doing anymore public beta testing? SD – We are always beta testing with folks who are in the company and close to the company. We are thinking about it, we may do some more beta testing with fans, so stay tuned. GPKNews – Can you give us any tidbits from the game that haven’t been released? Anything you want to reveal to GPK collectors? SD – Right now one of the things we are working on is, I know this might sound trivial, but card borders. Originally, when we first designed we had reimagined the card borders for the benefits of what you can do in Unity and gaming interfaces, more bling and interesting. But that’s not what the fans wanted. That’s one the things we got back from fans was, this doesn’t look like my set of cards. It’s really interesting, we’re going back to old school with this. Returning to your traditional, starting with white, but you progress to different colors as you advance through the game. 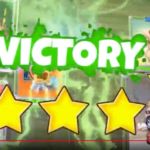 So you immediently know you have more powerful cards or you’re are up against a team that is more powerful through the color borders of cards. GPKNews – Finally, what’s your favorite GPK character? SD – Oh my God I don’t even know. I want to say Adam Bomb because its so iconic. Or the one named after me, I have to say, so we have not Savage Stuart, but the Mad Mike version in the game. I specifically didn’t want the card named after me, but we got the character in there, and he’s just damn lovable in the way we’ve brought him to life animated, its a lot of fun. In late December the team behind the upcoming mobile game, GPK the Game, sent out a newsletter to their mailing list to update fans on their progress. In the newsletter the company mentioned the successful community game testing that was a result of a contest they ran last October. They pointed out the feedback they received was fantastic and helped them learn more what fans want. In fact when reached for comment from GPKNews, they responded that, “The community testers offered helpful feedback and we are grateful for the time and energy they put into the game. Because it was so successful, we are hoping to open up another community testing session in the near future.” Keep your eyes open for a possible future announcement on community testing. The studio will also be asking fans their preference in various game dynamic such as characters, graphics, features, and effects. In their first monthly question the studio wants to know which pack of these three people like the most. You can head over to GPK the Game’s Facebook page now to vote. Jago Studios didn’t waste any time is meeting their Halloween promise to release a new trailer for their upcoming mobile game, GPK The Game. Early Wed. morning people who applied to be a game tester received an e-mail announcing the winners of the contest. Additionally, a new 30 second expanded trailer appears on gpkthegame.com as well as their Youtube channel. 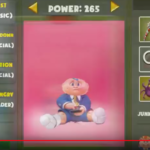 The trailer is broken down into three main sections that explain the main facets of the game, all while keeping a Garbage Pail Kids theme. The trailer starts off much like the previous shorter 5 second version. First they promise you can “Collect your favorite cards”. What is shown next is many of the character screens. 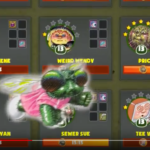 Adam Bomb, Tee Tee Stevie, Half Nelson, and Brainy Janie are all shown with various abilities and their junk. Next up we get what appears to be where you can see your card collection. Many more characters can be seen here. From there the trailer moves into the section where you can, “Battle till you barf”. Screens are shown with some of the battle scenes and the cards attacking, untimely resulting in victory. 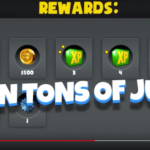 Finally, the game shows you can, “Earn tons of junk”. In true GPK form it appears items and power-ups are labeled as junk. What else would a good GPK battler need? Jago Studios announced there were over 1100 entries for their game tester contest. In a bit of a surprise, they announced that due to the overwhelming response they expanded the winners list to 10. The following people were announced as winners; Melanie R. in Lexington, IN; Michael M. in Colleyville, TX; Joseph T. in Johnson City, TN; Travis T. in Murrieta, CA; Jason H. in Mankato, MN; Randy M. in Aurora, CO; RJ H. in Nevada County, CA; David H. in Folsom, CA; Jennifer H. in Cincinnati, OH; and Jono S. in London. Jago also promises more contests to come in the months ahead. 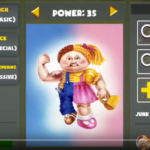 GPK the Game is set to launch in early 2019 and will be available in both the Apple App Store and Android Google Play. 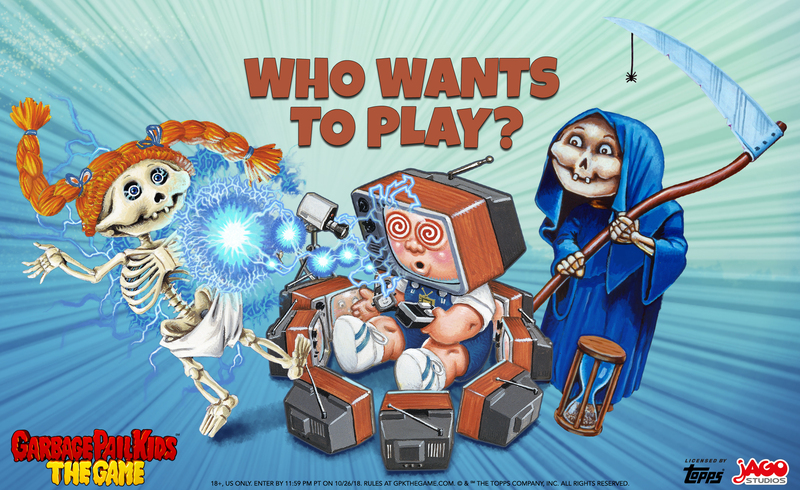 Jago Studios announced today they are offering a contest for three people who are interested in testing and playing an early version of the GPK The Game. 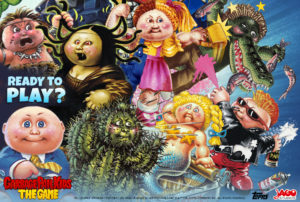 GPK fans can fill out a survey at gpkthegame.com to enter the contest. The company says winners will be chosen based on their fandom and experience. The deadline to enter the contest is 10/26. Winners will be announced on 10/31. See below for complete release details. The company also said they will release a new 30 second trailer to the public on 10/31. Anyone signed up to their mailing list will get to see the video on 10/30. As part of the release Jago says the game will now come out in early 2019. It will be available in both the Apple App Store and the Android Google Play store. Here’s today’s release from Jago. The winners of the contest will be announced on October 31, when Jago Studios will also release a new 30-second gameplay trailer. A private link to the trailer will be emailed to people who subscribe to game updates at gpkthegame.com by October 30, 2018. The three chosen players will have several weeks to play an early version of the game and will have a video call with the Jago Studios team to talk about the game, ask questions, and offer feedback. Garbage Pail Kids: The Game is an upcoming mobile card-battling RPG featuring iconic characters from the collectible trading cards and stickers originally issued by the The Topps Company in the 1980s. Currently in soft launch, the free-to-play mobile game will be released worldwide on the App Store and Google Play in early 2019. For more information and to receive updates on the game, visit gpkthegame.com or follow @gpkgame on Twitter, Instagram and Facebook. As promised Jago Studios debuted a trailer for their upcoming mobile game, Garbage Pail Kids The Game. This mini trailer comes in at a quick 5 seconds, and gives collectors a brief glimpse into the art and game play. 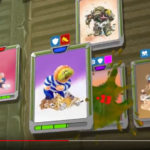 After two seconds of card images, we are treated to what appears to be a battle during game play. This two second portion shows two sides made up of character cards. Classic OS characters are featured. The battle shows Adam Bomb attacking and destroying Grim Jim and Frying Brian. 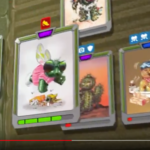 The characters on all the cards appeared to be animated during game play. For example Anna Banana is swinging from some vines, and Buggy Betty is flapping her wings. The sequence ends with a brief screenshot of the character screen for Adam Bomb. 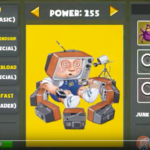 Showed what would appear to be a level 14 Adam Bomb, some unlocked and locked powers, (I could use the “Power of Angry” myself), and some items in a “Junk” section. While the trailer is short, the game does appear to be a “card collecting role playing game”, as the company stated in their initial release. The game is set to release in the App Store and Google Play later this year. Jago Studios, the makers of the upcoming GPK The Game mobile game, announced today there will be the first look at the art of the game at this year’s San Diego Comic Con. Today’s announcement was the first from the company since their initial release announcing the game. The company announced they will be passing out an art card at SDCC featuring art from the game. Once again Atomic Toybox will be the place to be for GPK fans. Attendees can pick up their card at that booth, #3921. There will be just one card available. The 4” x 6” card will be limited to 5000 copies only available at SDCC. Jago also announced they will be releasing the first teaser trailer for the game next week. People signed up to their mailing list at gpkthegame.com will get the first view on 7/23, while everyone else will get to see it on 7/24. 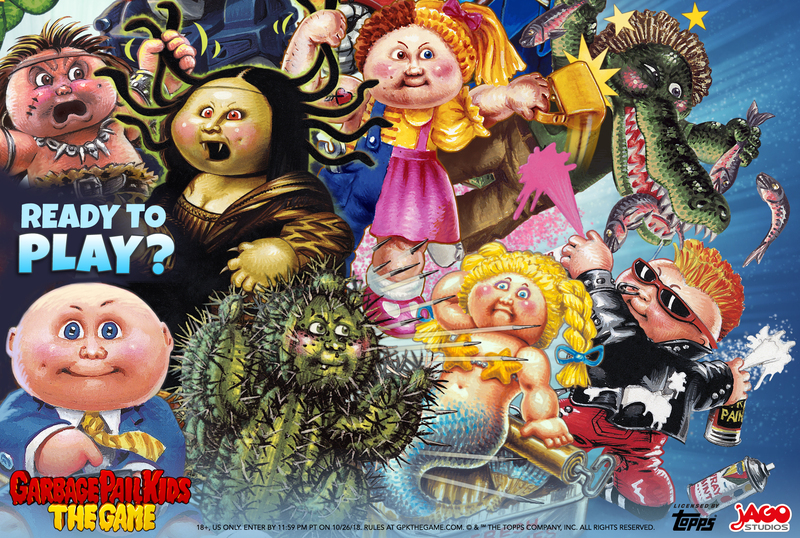 They will also be drawing a winner for a Creepy Co. GPK blanket and promo card from registered users. GPK The Game will launch later this year on the App Store and Google Play. Here is the complete press release from Jago on today’s announcement. provide Garbage Pail Kids® fans with complimentary art cards designed by the team behind the upcoming mobile game. The limited-run cards will offer a first look at the game’s artwork. Comic-Con attendees can receive a free card by visiting Atomic Toybox Entertainment, Booth 3921, which is hosting Garbage Pail Kids: The Game. For those unable to attend Comic-Con, Jago Studios will be releasing a sneak peek trailer on Monday, July 23 to all online subscribers. A private link to the trailer will be emailed to people who subscribe to game updates at gpkthegame.com by July 22, 2018. Anyone registered for updates will also be entered in a random drawing to win a Garbage Pail Kids plush blanket from Creepy Co., featuring beloved character Adam Bomb, along with a copy of the Comic-Con art card. Garbage Pail Kids: The Game is an upcoming mobile card-battling RPG featuring iconic characters from the collectible trading cards and stickers originally issued by The Topps Company in the 1980s. Currently in private beta, the free-to-play mobile game will be released worldwide on the App Store and Google Play. For more information and to receive updates on the game, visit gpkthegame.com or follow @gpkgame on Twitter, Instagram and Facebook. Founded in 2017, Jago Studios creates interactive social entertainment oozing with irreverence and virality. Their core team of game and brand veterans have decades of experience developing high profile, influential entertainment licenses and intellectual properties. Jago Studios invents, designs, and launches compelling play experiences made for mobile-first lifestyles, tickling the funny bone and strengthening meaningful social connections as people play together and laugh together. Jago is currently creating a series of comical free-to-play mobile RPG Card Battlers. Visit jagostudios.com for more information. Founded in 1938, The Topps Company, Inc. is the preeminent creator and brand marketer of physical and digital sports cards, entertainment cards and collectibles, and distinctive confectionery products. Topps’ leading sports and entertainment products include Major League Baseball, Major League Soccer, UEFA Champions League, English Premier League, Bundesliga, Indian Premier League, Star Wars, WWE, UFC, Wacky Packages®, Garbage Pail Kids®, Mars Attacks® and other trading cards, sticker album collections and collectibles. Topps’ app portfolio, including Topps BUNT®, Topps NFL HUDDLE®, TOPPS KICK® and Topps® Star WarsSM: Card Trader, has been a hit with millions of fans around the world. Topps’ confectionery brands include Ring Pop®, Push Pop®, Baby Bottle Pop®, Juicy Drop® Pop, and Bazooka® bubble gum. Topps was acquired by Michael Eisner’s Tornante Company and Madison Dearborn Partners in October 2007. For additional information, visit Topps.com and Candymania.com. SM & © The Topps Company, Inc. All Rights Reserved. 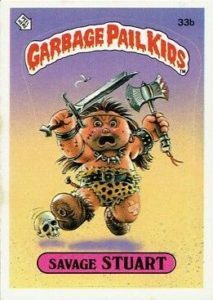 Garbage Pail Kids and GPK are registered trademarks of The Topps Company, Inc. and is Officially Licensed by The Topps Company, Inc.
Get your iPhone and Android cell phones fired up, because soon you will be collecting and battling with GPKs digitally! Today startup video game developer Jago Studios in partnership with Topps, announced a mobile game based on the Garbage Pail Kids franchise. Information about the game is sparse. 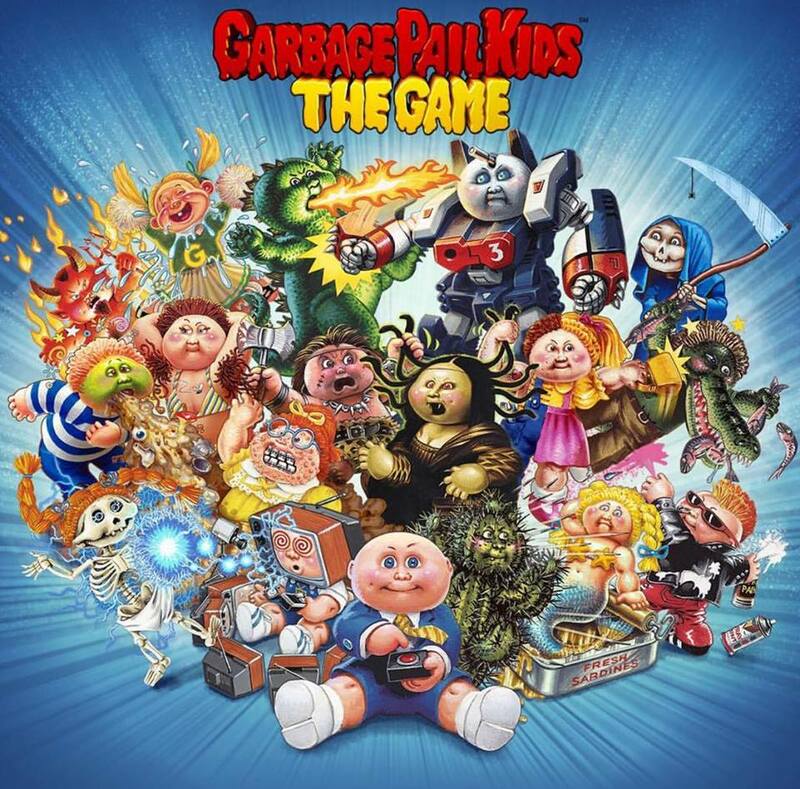 Right now based on their website and social media accounts the game is called, “GPK the Game”. In the press release Jago describes the game as a “card-collecting role-playing game”. 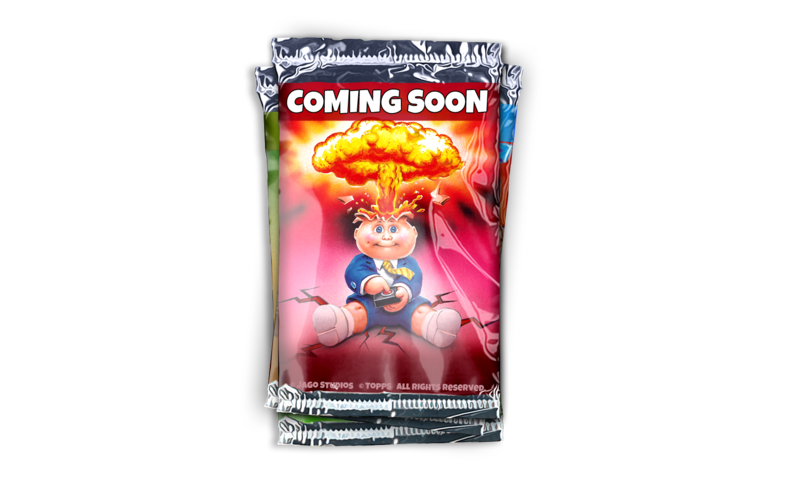 The coming soon images provided by the company show a number of different “packs” featuring Adam Bomb on the front. The company says they will be using characters from the OS series all the way to current releases. It would appear there will be more to the game than just opening packs and collecting cards. Topps Global Licensing President Ira Friedman also mentions in the press release that players will be able to, “virtually battle with GPK collectible cards”. Jago Studios is a brand new video game company started by CEO Stuart Drexler. Drexler has worked on digital games based on a number of major toy franchises over the last 20 years. For Disney, Drexler oversaw the hugely popular Club Penguin game. Topps has also been involved with a number of the same franchises, producing card sets over the years. This will be the debut game from Jago Studios. The company was launched specifically with the license from Topps to produce card collecting and role playing games for the GPK brand. Drexler, who will also serve as the Executive Producer for the game, said this on his partnership with Topps, “We are thrilled to be working with Topps and look forward to bringing these memorable characters to life in a new way fans can interact with, directly on their mobile devices.” Jago says the game is currently in a private beta stage. No release date for the game has been announced. The game will be “free-to-play” and available worldwide in the App Store and Google Play. Collectors can get updates from the company directly at gpkthegame.com or on Twitter, Instagram and Facebook. LOS ANGELES— May 22, 2018— Jago Studios, an independent developer of mobile games, today announced it is partnering with The Topps Company on the development of an upcoming mobile game based on Garbage Pail Kids (GPK). The card-collecting role-playing game will include characters from the original GPK line of collectible trading cards and stickers issued by Topps in the 1980s, as well as contemporary cards more recently released. Recently celebrating its 30th anniversary, GPK enjoyed massive playground popularity in the 1980s as children around the world collected and traded hundreds of millions of cards, much to the disgust and dismay of their parents. Depicting kids in foul and comical scenarios, such as Fryin’ Brian, sizzling in the electric chair or Tee-Vee Stevie, mesmerized by multiple screens, GPK created over 600 collectible characters between 1985 and 1988. Fans loved the outrageous parodies and passionately worked to complete their collections, with many schools banning GPK cards outright, claiming they were a distraction to students. 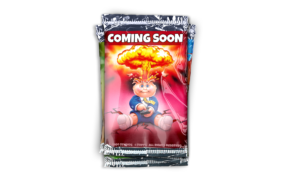 New GPK packs were issued in 2003 and were met with massive enthusiasm, initiating a new era for the notorious brand. Garbage Pail Kids cards continue to sell today at over 14,000 retail outlets across North America. Currently in private beta, this game designed for GPK fans is the debut project from Jago Studios with Drexler as Executive Producer. Drexler founded Jago Studios in 2017, launching the company with the exclusive license to develop card-collecting and role-playing games across platforms for GPK. He brings over 20 years of experience creating interactive games, toys, and content for global brands including Moshi Monsters, Habbo, Barbie, Elmo, Harry Potter, and LEGO. At Disney Interactive Media Group, Drexler oversaw product development across all of Disney’s virtual worlds, including the ground-breaking Club Penguin massively multiplayer online gaming platform. The upcoming free-to-play mobile game will be available worldwide on the App Store and Google Play. For more information and to receive updates on the game, visit gpkthegame.com or follow @gpkgame on Twitter, Instagram and Facebook. Founded in 2017, Jago Studios creates interactive social entertainment oozing with irreverence and virality. Their core team of game and brand veterans has decades of experience developing high profile, influential entertainment licenses, and intellectual properties. Jago Studios invents, designs, and launches compelling play experiences made for mobile-first lifestyles, tickling the funny bone and strengthening meaningful social connections as people play together and laugh together. Jago is currently creating a series of comical free-to-play mobile RPG Card Battlers. Visit jagostudios.com for more information. Founded in 1938, The Topps Company, Inc. is the preeminent creator and brand marketer of physical and digital sports cards, entertainment cards and collectibles, and distinctive confectionery products. Topps’ leading sports and entertainment products include Major League Baseball, Major League Soccer, UEFA Champions League, English Premier League, Bundesliga, Indian Premier League, Star Wars, WWE, UFC, Wacky Packages®, Garbage Pail Kids®, Mars Attacks® and other trading cards, sticker album collections, and collectibles. Topps’ app portfolio, including Topps BUNT®, Topps NFL HUDDLE®, TOPPS KICK® and Topps® Star Wars℠: Card Trader, has been a hit with millions of fans around the world. Topps’ confectionery brands include Ring Pop®, Push Pop®, Baby Bottle Pop®, Juicy Drop® Pop, and Bazooka® bubble gum. Topps was acquired by Michael Eisner’s Tornante Company and Madison Dearborn Partners in October 2007. For additional information, visit Topps.com and Candymania.com.